"I brought mate," was the first thing he said when he entered the recording studio. He was wearing a t-shirt with the image of the Virgin of Guadalupe and a windbreaker with the San Lorenzo logo, the club for which he is a supporter and ambassador. There waiting was the Argentinean Christian Holler director of El Camino Del Cóndor who chose Viggo Mortensen for the narration of his first project, a documentary that, through impressive images from Patagonia, follows the flight of the biggest bird in its habitat, the Andean foothills. Holler knew of Mortensen's interest in nature and understood that being a recognized, bilingual voice, he would be ideal for the narration that was first recorded in Spanish in London and later in English in Buenos Aires. So, the most Argentinean of American actors added another activity to his considerable artistic agenda. Mortensen does not stop. He had just premiered The Road in the United States, the post-apocalyptic film based on a Cormac McCarthy novel (that won him the Pulitzer), in which he stars with Charlize Theron and Robert Duvall. The film, which opens in February in Argentina, puts him again in the sights of critics as a great Oscar candidate, which eluded him after his nomination for David Cronenberg's Eastern Promises. But film is not everything in Viggo's life. Besides living from afar with his eye on daily soccer news from El Cuervo, he writes poetry, publishes books, paints, plays music...and in Februrary, returns to the theatre in Madrid to perform in Purgatorio, the new play by Ariel Dorfman. In between press conferences for The Road, he spoke with Newsweek about all of these subjects and referred for the first time to his participation in Holler's documentary. His childhood vacations in Patagonia, his concern for nature, his artistic concerns and a project which will bring him to Argentina in 2010 to make a film with director Ana Piterbarg. What gave rise to the idea of participating in El Camino Del Cóndor? Christian Holler proposed it and I liked the idea. The problems was to find a good time for recording the narration in English as well as in Spanish. I am interested in animals and natural areas. When I was a child in Argentina, our parents took my two brothers and I several times on trips to the south, and sometimes we spent Christmas camping in Patagonia, where the condors that we see in this film live. I love that part of the world, the flora and fauna of that region. What memories do you have of the Patagonia? They are memories from childhood. Small lizards I found, trout we caught, and above all the immensity of the natural spaces, the endless sky and the sudden climate changes. Christian invited me to go back, meet his family, go horseback riding and go up to the heights to look at some of the extraordinary places we see in El Camino Del Cóndor. I'm thinking of accepting and going to the South to enjoy that beautiful part of the world. How were those first meetings with the director? We met in London, where we recorded the first part of the narration. We had mate and ate great quantities of chocolate and alfajores. There was a jersey and a San Lorenzo flag in the studio, but we didn't talk that much about soccer. And the recording session in Buenos Aires? 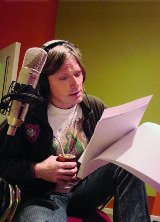 In Buenos Aires we fine tuned the narration, and the truth is I felt a bit more relaxed recording in Argentina. It was also nice to see more images since, by then, Christian had finished the final editing. Do you think these kinds of documentaries can be of help to the preservation of the condor in particular and raise the awareness about other species at risk of extinction? Absolutely. Especially when it demonstrates so clearly the risk the condor runs due to the lack of education regarding the behaviour of these birds, how precarious and essential their survival is to nature's cycles. When we see the beauty of the condors, the landscapes of the Patagonian and the Andean mountain range through Christian Holler's lenses, we feel moved and it serves as a motivation to learn more about the environment and our relation to it. Your last film, The Road, tells a story after the Apocalypse has happened. What's your point of view regarding humanity's self-annihilation? Well, to me, from what I've learned, it is obvious that human beings have a lot to do with the future of natural areas. The film doesn't specifically deal with it, but it is likely we would think about our relation to the environment after seeing the destroyed landscapes in this film. Some comments in the international press remark on your acting, speculating on a new nomination for the Oscar. What importance do you attach to the Hollywood Academy Award? As Julio Cortazar wrote, "because yesterday is never/and tomorrow, tomorrow, " that is, if it happens, it happens. And if not, it doesn't. The recognition would be a big help to us in making sure The Road reaches the theatres and audience that this moving story deserves, since North American distributors were of little help with the promotion of the film. I think that awards and nominations are a crap shoot, a game of chance, and one shouldn't think about them too much, Accept it, with gratitude, if the film is nominated, yes. Win or lose with dignity. And that's it. What other activity are you most involved in nowadays? I´m writing, editing other people's books, and also rehearsing the new Ariel Dorfman play in Madrid. To me, there's no artistic activity that stands out above the others. All of them interest me.